L'alpinista farà di te un avventuriero! Amerai il lussureggiante splendore naturale tutto intorno! Salire a grandi altezze con Alpinista! Liberato dai fardelli della vita quotidiana, emerge rinfrescato, rinnovato e pronto per l'avventura in questo affascinante chalet con tre camere da letto. Situato in un lussureggiante terreno boscoso nella famosa comunità di montagna, questa casa delizia con accoglienti arredi per la casa, ampi posti a sedere e altro ancora. L'incantevole mazzo avvolgente della casa è destinato ad essere il preferito della famiglia. Quindi, siediti e stai un po '! Ti innamorerai appeso in veranda, sorseggiando una limonata dalle sedie a dondolo e osservando la giornata che si svolge, la foresta intorno a te che canta con i dolci suoni della natura. Nei mesi estivi, l'accesso al lago della vostra casa si trova a breve distanza. L'alpinista è un must! Mountaineer is a nice house in a good neighborhood that’s close to everything and convenient. The hot tub is great! We really enjoyed our President’s Day weekend with friends. Once suggestion - please update the technology in the house! Box TV’s with no way to hook up a DVD player or game system if you bring kids. An old stereo with no auxiliary or component input that you can hook a phone or tablet to listen to music. I actually went out and bought a Bluetooth speaker. The cost of updating these things would not be prohibitive. Thank you for your review and for your thoughtful comments. We are always looking for ways to grow and improve the experience in our homes. We hope you come visit us again soon. This property is beautiful! The furnishings were comfortable. Great place! We traveled to The Mountaineer from Annapolis for a4 night stay. We loved it! It was clean and spacious. The kitchen was well stocked. The setting was fabulous with deer walking through the yard in the morning and evening. Close to Wisp ski resort and the hot tub was wonderful! I would recommend this cabin for a family or group. Wonderful! Thanks for sharing. So glad you enjoyed your stay at Moutaineer! 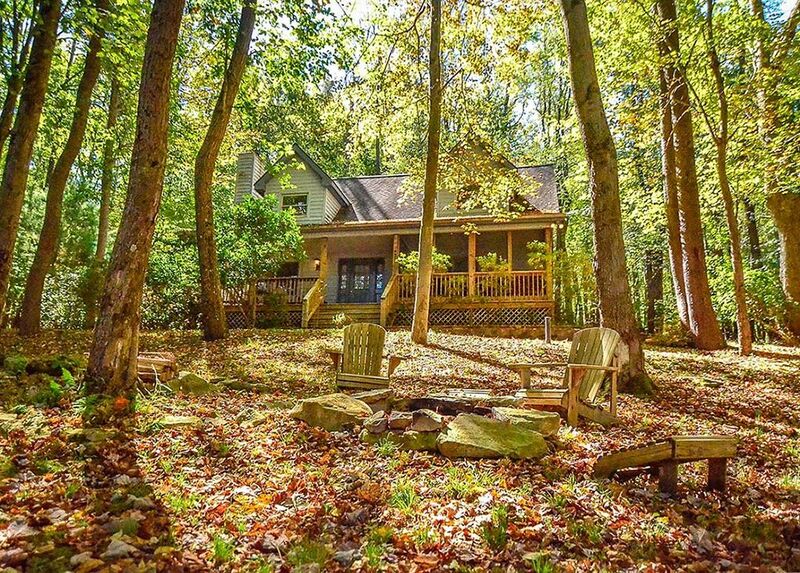 The house is in a nice secluded area right off the lake. Ideal private location! Clean and spacious with all you basic needs if you’re wanting to spend some time at the home. We loved the fireplace and porch areas! The hot tub was very clean and easy to use. Some things need updated like the pots and pans, bedding/pillows, old box tv, hot tub cover, as well as, the wood deck retained water and froze into ice because the 2x4’s are not spaced out at all. For the price of the stay it is reasonable for what you get. We would stay there again certainly and these are basic fixes truly. We drive a truck so it was no problem getting up the snowy driveway. But anyone with a car may need to just park at the bottom if weather is harsh. We brought our own pool towels to use, and thankful we did, due to the one towel per person availability. If you’re used to the simplicity of an Airbnb check in/out this was a lot more time and travel involved. We had three times we thought were our check out 1.vrbo 2.the home rental co. 3.the time listed on our check in sheet. Just make sure to call and ask. We waited a half hr. At the front desk for them to tell us we couldn’t go to the house till 4pm on the dot and they didn’t want to give the key till then. Check out expected was I believe 10am. That’s a tad early, is how we felt, to be able to eat, clean up the place And pack up, then to drive the garbage up to the bin and drive to the place to drop off the key, in rainy snow conditions. Would recommend an 11am atleast for people was one of the main complaints we had. If you want a private, relaxing, woodsy retreat to maybe ski and come back and cook and relax this place is amazing and I would recommend it to anyone! Plenty of bedrooms for a family stay and huge dining table for food and games. We will be back for this same type of trip in the winter for sure! The house was much better then the pictures projected online honestly. We were pleased by that. Loved our 3 day quick vaca. Thank you so much for your feedback. Mountaineer is such a sweet and serene retreat and we were glad you were able to come enjoy the home. We appreciate your notes on things that need checked. We will absolutely take a closer look at these items and see what we can do to improve them! You are correct that there was mismatching, and incorrect, information circulating regarding the home's check in. We have since fixed the issue and the 4pm check in time displayed on VRBO is correct. Thank you for bringing this issue to our attention! We apologize for the confusion. Thanks again for sharing with us. We hope to see you again soon! This home is an amazing value and such a fun place to stay for family get-togethers at the lake. Thanks for sharing. We hope to see you all again soon! Beautifully renovated interior, plenty of room. Hot tub, porch and fire pit area are great amenities. Will definitely return! Thank you for sharing! Sounds like a really wonderful experience. We hope to see you again soon! The house was very nice. It served our needs very well. The only criticism would be the driveway. It is not paved and has a steep grade. I would not want to drive up it in snowy or rainy weather. Thank you for sharing your thoughts with us! We are glad to hear that you had a nice stay. As a FYI- While this house does have a steep driveway, we make every effort to communicate this with guests in advance of any winter reservations, so that guests know to bring 4WD/AWD vehicles during these months.